It’s no secret to my readers that learning French has turned out to be a bigger challenge than I thought. I started out so gung-ho only to find that the stresses of acclimatizing to my new life abroad were making it impossible for me to focus on language-learning. What I thought would be my number one priority became the last thing on my mind! Eventually, it became a downright aversion. I let myself off the hook. I stopped trying to force it, and that was the right decision for me. But now, I sense a complacency encroaching, and I don’t want to be one of those people who lives here for 12 years and still can’t speak a lick of French (due to apathy rather than a cognitive challenge). My husband doesn’t speak French, so there’s no practice at home. All of my friendships and/or business relationships are with native English-speakers or French who speak English, so there’s no practice there either. I’m a bit of a perfectionist and tend to be ultra hard on myself. The truth is, one CAN indeed get away with not learning the language and still live here. It makes the world a bit small, but it can be done. There are consequences, for example needing help with critical communications and living with an undercurrent of fear of crisis, but it is possible. Since I don’t like the idea of living in such a small world and don’t much care for the consequences of not speaking the language, I’ve decided to try, try again. So, I’ve headed back to school to my neighborhood French classes! Having been through, oh, six or so teachers, I’ve returned to the one I started with here. I seemed to learn the most from him. Whether that is because I was more motivated when I began there or whether he’s just a damned good teacher, I don’t know. What I do know is that not all teachers are created equal, just as all students learn differently. There needs to be a good match in style between teacher and student for anything to click. I’m in a group of welcoming intermediate speakers. The class is given almost entirely in French. I only understand about 50% of it, but I don’t mind that so much. Mostly, I just want to expose myself to new vocabulary and a new insight here and there. I want to have opportunities to enjoy the language again rather than be intimidated by it. The point is that I’m determined not to make “French class” a stress. This is a major shift that I want to cultivate and maintain. Maybe it took me a year and a half to work through being okay with not knowing. I’ve said “je ne comprends pas” and “je ne sais pas” and the dreaded “je ne parles pas Francais” more in the last year and a half than I’ve ever done in English in all the other years of my life combined! All that reaffirming of what I “can’t” do can’t possibly be good for one’s ego day in and day out! It does, however, make it essential to drop one’s ego, come out of hiding, and stand proudly ignorant before the masses. So today, I sat there and let the words flow over me. Some I knew. Some I didn’t recognize. If my mind flew out the window to think of other things, I let it. If I made a mistake, I did my best not to care. If I had no idea what someone was talking about, I let it roll off my back rather than sitting there pretending I got it. My instructor said, “Ask questions.” And I intend to…but only if I really think it’s important. I don’t need to understand everything. Isn’t that wonderful?! I hope that if I have a day where my mind is overloaded and not functioning all that well, I can still uphold a “who cares” attitude. It certainly feels better! Show up. Make it enjoyable. Forget the rest. Long before I even knew it was possible that I would ever live in France, I had a desire to learn the French language. I was at the top of my French class for two years in High School, so I had a positive association with it. Besides, it seemed that my bilingual friends all had more fun. So, when I actually knew I was moving to France, I was looking forward to the language experience. Was. I told myself that my priority would be language learning. I intended to take as many lessons as I could throughout the week. I even started before I left, taking some lessons with a friend and using online resources like Duolingo. Once I got to France, though, I was faced with an unanticipated reality. My French-born bestie back home had filled my head with ideas of free French lessons designed to help immigrants fit in. Having taught in a Continuing Ed program at a college, I had preconceptions of free daily classes taught by entertaining teachers. I loved the idea because I learn better in groups. Unfortunately, the reality was that I was way too far away from any such program, living in the country as I was. And having just arrived, I was nowhere near tapped into life here to know what was available. However, eventually, as luck would have it, I found affordable group French lessons once a week in the closest town fifteen minutes away. What a godsend! The teacher was a Brit with dramatic flair and fabulous sense of humor. I was so bewildered and homesick at that time, it was always a delight to go to class and remember how to laugh. I also made friends with a couple of native speakers and had some lessons that way, but it was far too easy to succumb to speaking English instead. Eventually, other classes surfaced nearby. Of course, they weren’t free, but they weren’t wickedly expensive either. Some of them were better than others. I ended up quitting one class even after purchasing an pricey book because it was just too slow for me (hard to imagine!) and the content seemed far too touristy. About six months in, I eventually learned of a program for which I qualified through the French unemployment bureau. I signed up but never heard anything back. With some persistence, I did finally manage to re-enroll after several more months. The class only met once a week, but it was free, and it was all morning long, but for a while, I was the only student. This had advantages and disadvantages: the positive was individualized attention; that also happens to be the negative. This situation eventually morphed into two classes a week, both mornings and afternoons. Now sometimes, there are other students, but usually it is just me. I was so excited that I’d be going to classes twice every week for the entire day. Was. Quickly, I began to realize three things: 1) I hated waking up at 7AM 2) I hated having a two-hour lunch break with nowhere to go and 3) there was no room in my poor brain after 2.5 hours of French, let alone 6! Maybe immersion is the way to go for some people. I can’t think of a bigger nightmare. I get so flippin’ exhausted! I can’t imagine being in it all day every day. Maybe it’s because I’m introverted; I need to be alone with my thoughts. At any rate, more is not necessarily better! When there were other students, I could get a lot more out of the day. When I’m on my own though, it’s quite difficult because of the intensity…and frustrating too because what I need most is conversation with others. I know that stress has a huge role to play in one’s ability to learn a language…or anything else for that matter. Fact is, settling into a new country is a stressful endeavor. When you are worried about figuring out why there’s a problem at your bank or about whether or not some important piece of paper has been lost or processed, it leaves less room for new stuff. When class rolled around, some days, my mind would be on other things making it very difficult to pull up the words I needed. This had no end of negative impact on my self-confidence and sense of self as a highly intelligent, capable person with a love for learning. In fact, I increasingly felt as though I was living through the eyes of my fragile special needs students back home. I had a sense of what my brain was supposed to be doing, but it just wouldn’t cooperate, making me feel like a failure. When I had a medical emergency last year, I couldn’t say anything but “merci” at the hospital. The doctor was a real prick about it too, making fun of me. 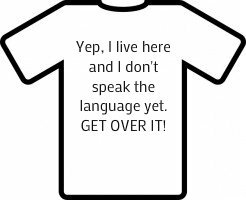 (He inspired the above T-shirt!…though it is mostly me who has to get over it!) Believe me, having a crowd of nurses and doctors over your head saying things you don’t understand while they do whatever they want with you is sufficiently nerve-wracking to affect one’s ability to communicate anything! Even though I came here with learning French as my priority, the fact is, other things took over…important things…like my mental health. I had to battle growing anxiety; there were many relationship problems and bureaucratic obstacles to work on too. I needed time for making friends and other things that were actually enjoyable to me just to keep myself sane. Then I realized I had to get going with my business, promoting, networking, writing, painting… I had to keep some semblance of life going because I was falling into despair. Finding myself and my happiness became my priority. French was just another unpleasant but necessary task I had to do every week. I felt some guilt over this. How dare I come live in a country and NOT make the language my priority? But life was happening, and if I wasn’t careful, I would end up sick, tired, and even more depressed than I already felt. I am not married to a French-speaker. I’m married to a Brit who barely speaks French himself. So, we don’t use any French in the house. It’s a definite handicap. In addition, this region is absolutely crawling with English-speakers. I’m glad, actually, because it is saving my life. But at the same time, it sure doesn’t motivate me to learn more French. I realize it will ultimately shrink my life to the size of a peanut if I don’t learn, but for now, while I’m still just trying to acclimate and be at peace, I’m not terribly motivated to push. In my life, there have been many things I wanted to learn…how to play guitar (abandoned), karate (abandoned), reading music (abandoned), Chinese (abandoned)… Who knows why we both decide to pick something up and why we eventually put it back down again? If I stay in France, obviously abandoning French won’t be an option. But to be honest, it is one of the biggest reasons I want to leave! As my current French teacher has pointed out, I’m a person who is used to having the ability to express herself in complex ways. I can’t do that in French. It is extremely frustrating. I have no interest in small talk, the weather… every day life, so to speak. I want to talk philosophy. I want to get complex! Alas, I have to contend myself with the mundane. There are just so many words I don’t know. I know what I want to say, but as I think how to say it in my head, I never know where to begin and everything just freezes. If I don’t know the first word, I suddenly don’t know anything. It is easy to fall into this idea that I’ve hit some kind of learning plateau in my first year… a plateau I’ll never get over. If I think back to how much French I knew last year at this time, I really have made progress. However, for whatever reason, on some days, I seem to forget everything! I’m not sure if it is because I’ve fooled my teachers into thinking I understand more than I do (I’m very good at not really knowing what anyone is saying but using context to figure it out), or if it is simply my almost 50-year old brain straining to remember things. I know that a lot of people here give up learning the language. They feel it is too difficult and don’t feel they ever make any progress. I think I myself am going to have to fight those feelings. I’m not ready to give up yet. I might never be fluent, but it would be nice to feel somewhat confident that I can get by. What has your experience been like learning a second language? What have been your biggest obstacles? The first is a series of French lessons created by Vincent of Imagiers. I find his teaching style delightful, straight-forward, and logical. It’s suitable for beginners to advanced. I’ve been working through the first 4 units, and so many questions I didn’t even know I had are being answered. He’s helping me push myself, and I really needed that in a way that worked for me. The other channel I have fallen in love with is Comptines et Chansons. This is a site of children’s songs so beautifully done that I’m finding them delightful to my inner child without being insulting to my adult self. The songs are beautifully sung, the instrumentation is not overly absurd, and lyrics are provided. The tunes are so catchy that I find myself singing them throughout the day and even craving them. Of course, I have a natural predilection toward music and singing. A couple of my favorite tunes here include Lundi Matin, Mon Ane, and Il Pleut Il Pleut Bergere. There are tons, though, and I’m just getting started. I hope you find these inspirational and helpful as I do. Learning French II: Anglench or Franglish? Last night, I attended my very first soiree that my native French-speaking friend and teacher MayaJoelle held at her house. It was an evening of French and a potluck followed by a French movie. It was a well-timed opportunity for me to experience immersion before I really experience immersion. What it showed me is that my dabbling with French since May and mere three lessons with MayaJoelle in the past few weeks have actually been effective. I’m learning to converse! Granted, I understood about 15% of what was going on around me and probably spoke even less, but I was able to interact, nonetheless. I am proud of myself, but also painfully aware of how much there is yet to learn. It makes me feel like a child. Fortunately, I was in a room full of encouraging adults not overly amused with my slow, stilted, and sometimes grammatically incorrect attempts to speak. I actually constructed some decent sentences and listened for familiar phrases here and there, gathering meaning from gesture, facial expression, and context. The mind really is an incredible tool, hell-bent on understanding. At one point, I had a rather one-sided conversation about French immigration with someone, and though I didn’t really know what he was saying, whether he was telling me about what I’d be facing or what he was facing, my mind had decided to interpret his words and make meaning from them. I may never know whether my assumption that he was speaking of his own experience was correct. I was thinking in the car on the ride home in a sort of Anglench…or is it Franglish? It made me think of some of those Bollywood films where the actors will suddenly throw in an English phrase mid-sentence. I even caught myself thinking, “Je ne sais pas”…as if that was the only way to say, “I don’t know.” Maybe that’s the approach I need to take. In order to get as much practice as I can with what I know, perhaps I should be using as much French as I can in every sentence I speak, using the English when I don’t know the French equivalent. Another thing I noticed was this weird reflex to throw in Spanish or Italian. I think I said, “Gracie” about three times. After listening to one man share a brief story, I almost blurted out, “Il parles muy bein francais!” Fortunately, someone else spoke first. The fact that I’m going on a spiritual journey to Mexico in a couple of weeks is NOT going to help matters! Of course, there, I’ll probably be speaking some kind of Spananglich. Frenishlench? For years, I’ve wanted to relearn the French language having studied it both when I was a in 5th grade and in high school for a couple of years. Now that Stuart and I have made our decision to settle in France, it is imperative. As soon as I knew I’d be visiting France, I started using an online learning program called Memrise. They have several free French courses, some better than others, which I really enjoyed. For someone who just needs some familiarity with survival lingo, it’s a great place to start. What I like about Memrise is the science-based learning approach that utilizes memes or images you choose to make remembering a concept easier combined with sight, sound, and of course, repetition. I also like the daily reminders to practice. It isn’t that intuitive though; by that I mean that sometimes, even though I typed in an appropriate phrase, it would be regarded as incorrect because it wasn’t the phrase they expected…and I’d sometimes lose points for typing errors. Stuart had a CD series of French lessons that I am now using created by Michael Thomas. I like the approach he takes focusing on the cognates and having two pupils who interact with him on the CD, making it more like attending an actual class. You are supposed to pause the CD each time he asks someone to say something en francais, but so far, I haven’t had to do that; I’ve been managing to answer before the students. I imagine it would be a bit of a pain if this were not the case, to be pausing the recording every few minutes or seconds. Still, it’s a good program that has one spitting out complicated strings of words in no time. But so far, my problem is that I have no means to apply what I’m learning…yet. I also just started getting some French tutoring from my friend, MayaJoelle. She is of French origin and a wonderful French teacher and tour guide. I’m blessed to know her, for her approach is one that focuses not only on the cognates but also on the musicality of the language…something I do understand. She’s also giving me what no online or CD program can which is correction in pronunciation and actual interaction. Ironically, I sometimes wish I could press the pause button working with MayaJoelle! She’ll say things or ask me to say something sometimes that I just simply cannot get my head around…but that’s good because it is what I will no doubt experience in France…the panic and utter confusion of not being able to “find the right word”. MayaJoelle offered me the tip to label everything in my house with its French word. I don’t know why I didn’t think of that sooner. It’s a great idea, and I plan on getting to work on that in the next few days. She’s also recommended watching French movies and listening to French music which I’ll be doing with online resources. I kind of see learning French now as my job. It is something I must do daily, like exercising and brushing my teeth. It requires a great deal of attention and focus. The more I pour myself into it here, the less intimidated I’ll be when I arrive in France. N’est-ce pas?